The Reilly T325 provides a very smooth ride with the sort of handling that will allow sporty types to indulge their performance aspirations. It's fast and very direct. It's a worthy alternative to a carbon fibre race bike. Mark Reilly has been designing and building frames for 30 years, but this is the first time he has put his own name to a frame. There's also steel and carbon fibre frames on offer too. 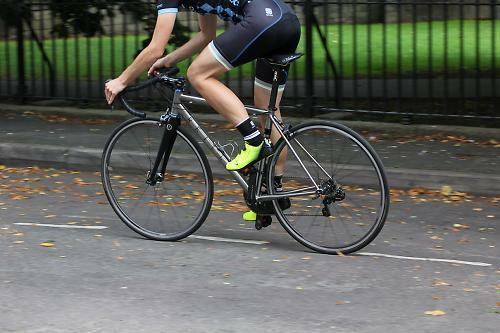 I've been riding the T325, the most affordable in his range of titanium frames. It costs £1,599 for the frame or £1,978 with a Reilly carbon fork and Chris King Inset 7 headset. There's also an Enve fork option, which pushes the price up to £2,099. And if you want disc brakes there is a model with discs. Reilly supplied a bike equipped with Shimano Ultegra Di2 groupset and matching Shimano wheels and a mix of Deda, 3T and Fizik finishing kit. Complete bike weight is 7.86kg (17.33lb). For the T325, Reilly has used 3Al/2.5V double butted seamless titanium. You can see where the name has come from. 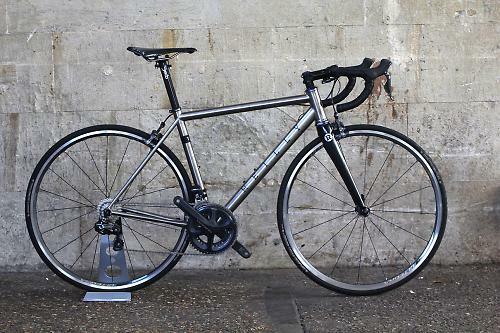 It's a very common flavour of titanium amongst frame builders. 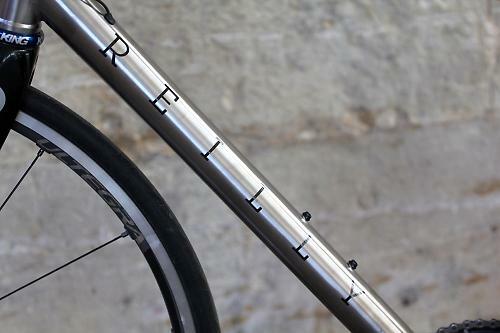 Reilly has looked to increase the stiffness factor by oversizing the main tubes and the head tube, which is 44mm. These design details make sense for a frame that is intended to be at home in a road race or fast sportive. Frame weight is a claimed 1,275g. It's only giving away a few hundred grams to a carbon fibre alternative. 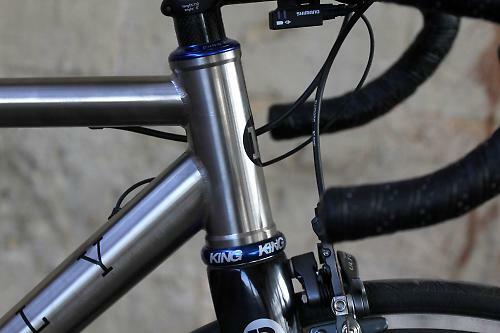 If you're buying titanium, though, weight likely isn't top of your list of priorities. With increasing requests for wider tyres from the cycling community, the T325 will accommodate 28mm tyres. Despite the racy intentions and oversized main tubes, Reilly has retained a traditional English threaded bottom bracket. The seat tube accepts a 31.6mm seat post keeping with the clear stiffness message this frame communicates, instead of the more common 27.2mm seat post to provide additional comfort benefits. This frame is Di2-specific as well, but you can opt for regular mechanical cable routing if you don't want an electronic drivetrain. Titanium has become a lot more affordable in the last decade, and the quality on offer even at this price is commendable. The frame is beautifully finished, with compact cowled dropouts and shapely rear stays. It's all finished with an elegant typeface on the down tube that provides a visually seductive appearance. The Reilly T325 gives a sprightly ride once you stop admiring its appearance and get it out on the road. Escape the busy city streets and get it into the countryside and the T325 really starts to win you over. There's the smoothness you expect of a titanium frame, but it's not at all soft or vague, if anything it's stiffer and more direct than many titanium bikes I've ridden over the years. Where the T325 most impresses is on the descents. The sensation when you bank it into a wide fast turn is quite exceptional. The small amount of initial flex helps to smooth out rough road surfaces that can unsettle a stiffer bike mid-corner. 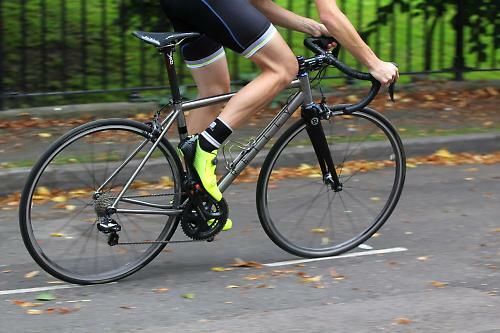 It's no slouch on the climbs, and the front-end doesn't is reassuringly stiff under load. I didn't get to race the T325, but I reckon it would be right at home in a race, maybe with some deep section wheels to boost the speed. Titanium has a distinctive ride character, and cycling journalists can easily get too wrapped up in the 'magical properties of titanium' and its 'springy ride'. Not all titanium bikes ride the same, and that's the case here: the T325 rides very differently to the Van Nicholas Chinook I reviewed recently, a bike that is arguably showing its age. In comparison, the Reilly is stiffer and more direct. A more favourable comparison is the Enigma Evade Ti. It really helps you when you're trying hard to extract every last watt out of your legs in top gear when chasing you mates up a hill or racing for the village sign. Helping to give a focus on going fast is the geometry. With the short head tube, it puts you in a head-down position, and the compact rear triangle keeps the handling sharp and pointy. It's not as relaxing or stable to ride as the Chinook, but it's more eager to indulge your desire to go fast. If you're reading this and thinking it's not for you, Reilly will do a bespoke geometry to better suit your riding requirements. 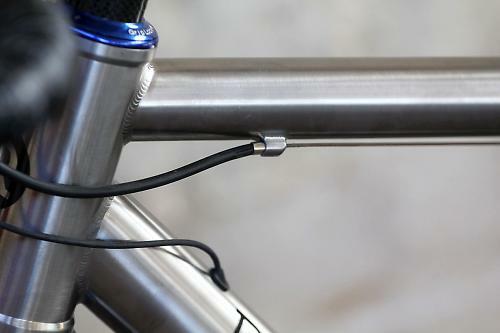 Titanium might not be a cutting-edge material, and it's a long time since Greg LeMond raced a Merlin Extra Light in the early 90s, but the material is getting more popular all the time with cyclists who yearn for something different. While many people look to harness titanium in an endurance bike designed for all-day comfort, the Reilly T325 goes in the other direction and is full of speed, sharp handling and playfulness. If riding fast is high on your list of priorities, be sure to check out the T325.